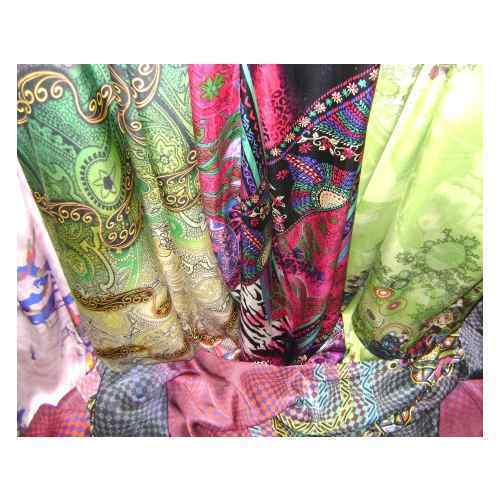 We are involved in offering our clients a startling collection of Designer Digital Print Fabrics that are widely appreciated by our clients for their unique designs, comfortable fittings, shrink resistance features. We are also involved in offering the range in customized forms as per the needs of our clients. We are a name to reckon with as manufacturers,exporters,wholesalers & retailers of a breath taking array of ethnic and contemporary range of Sarees and Suits. Crafted on high quality materials our range is valued for fashion, style, color fastness, prints and exquisite embroidery. We have unique collection of printed & embroided sarees & suits made in exclusive Crepe-de-Chines, Georgette, Chiffons, Silks,Cottons & Viscose. Our in house designers and craftsmen have an intuitive knowledge about the current trends and design the range accordingly. Our sarees and suits are ideal for both formal and in formal occasions. We have our own Printing Unit near Faridabad.